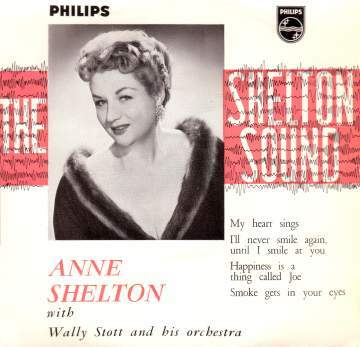 Anne Shelton's career blossomed during the latter part of the second world war. She started recording in 1943 and became one of the best loved singers to be heard on the radio at the time, especially by members of the armed forces. She had a sister who also became a successful singer, although Jo Shelton was always overshadowed by her much more famous sibling. Anne's singing skills came to the attention of the great bandleader Bert Ambrose during the war and her fame grew rapidly as singer with his orchestra. After the war Anne gained an invitation to sing with the Glenn Miller orchestra during the legendary band's tour of the UK. Her acceptance led to further opportunities, including her own tour of the USA which lasted almost a year. As a result of this she became a popular star in America and was one of the first British born singers to have significant record sales on that side of the Atlantic. Anne's chart successes during the late 1950s were really quite modest apart from her massive #1, 'Lay Down Your Arms', a song which seemed to marry well with her association with the armed forces. Although she never returned to the charts after 1961 she remained a popular and revered singer for many years, but never really escaped from her wartime image. She frequently gave up her time and energy in aid of various British Services charities up until her death during 1994. The EP shown on the left (Philips BBE 12169) is from 1957 and carries some interesting sleeve notes written by John Franz as well as a nice picture of the singer herself. Apparantly, Anne's stage career began at the age of 14 as an impressionist- not a singer! I presume that her repertoire included singers of the day, but Mr. Franz does not say. In any event, this side of her talents doesn't seem to have been exploited for very long because she began singing on BBC radio during 1942 in a series of her own entitled "Introducing Anne". Upper list includes UK 45 singles releases only (Note that Anne had many more releases on 78rpm). Philips BBE12090 1956 "Anne Shelton"
Philips BBE12169 1957 "The Shelton Sound"
Philips BBE12205 1958 "The Italian Touch"
Philips BBE12218 1958 "Anne Shelton"
Philips BBE12292 1959 "Just Love Me"
Philips BBE12344 1960 "Songs Of Faith"
Philips BBE12347 (SBBE9003) 1960 "My Yiddishe Momma"
Philips 433.635BE 1963 "There's No Song Like An Irish Song"
Philips 433.636BE 1963 "When Irish Eyes Are Smiling"